Concrete placing booms can be extended in different ways depending on the operating conditions. When used outdoors on building sites, the articulated joints and their bearing positions are subjected to harsh conditions. Constant temperature fluctuations, moisture, dirt and chemically aggressive concrete or cement dust all influence the durability of the bearing positions. The booms must always function reliably. The bearing positions must therefore be robust, wear-resistant and always have a high freedom of movement in every boom configuration. Signs of corrosion after longer downtime periods must not lead to the articulated joints becoming stuck. 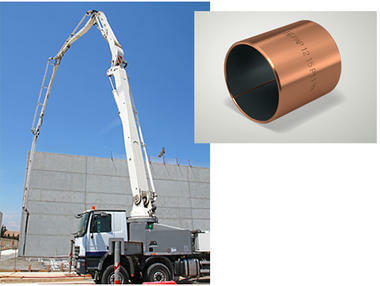 The bearings must slide smoothly to place the concrete exactly, even when subjected to minor swivelling motions. The bearings must not fail prematurely due to abrasive sand or cement particles. operating conditions of this application. The bearing position has also been sealed with grease to ensure that no dirt can infiltrate it. In addition, this grease protects the pins of the joints from corrosion, and squeezing out the grease cleans the bearings. KS PERMAGLIDE® P11 plain bearing bushes are robust and reliable in operation with a minimum of sealing effort – and under harsh conditions. These properties make KS PERMAGLIDE® P11 plain bearing bushes ideally suited for bearing the articulated joints in concrete placing booms. KS PERMAGLIDE® P11 is a leaded, robust bearing material that has the highest levels of tribological performance. The material is designed for maintenance-free, dryrunning applications, but can also be used in systems with liquid lubrication. Concrete placing booms are booms that are attached to utility vehicles or special columns, and that have pipelines through which concrete is pumped. Using one or more articulated joints, the booms can be folded up to be more compact or raised and aligned precisely. After use, the boom is cleaned with water and folded up completely.